An extensive vocabulary is a valuable tool that will help your children in every arena of their lives: academically, vocationally and socially. An excellent vocabulary will improve one’s ability to understand other’s ideas, comprehend the ‘grammar’ of a field of study, and to better articulate one’s own thoughts, opinions and beliefs. In our family, the development of an excellent vocabulary is one of the benefits of a Charlotte Mason education that we have observed firsthand. 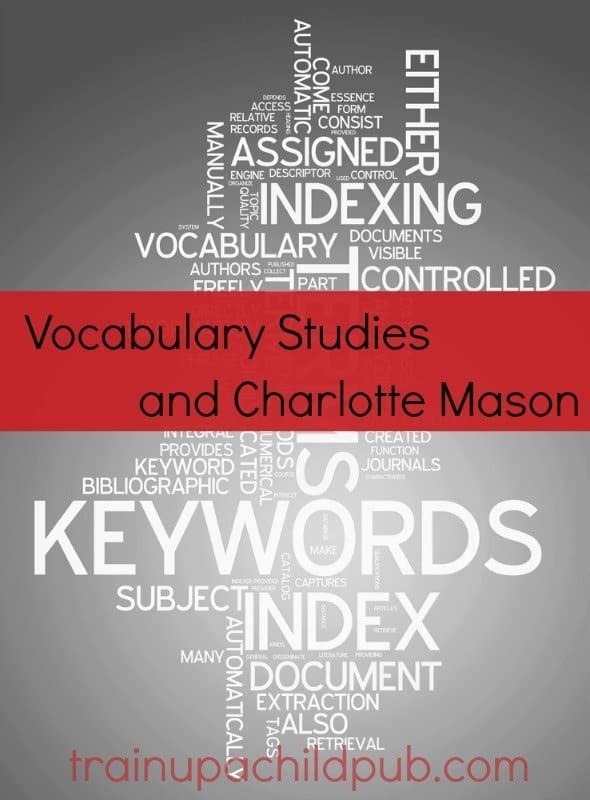 Why do vocabulary studies and Charlotte Mason methods work so well together? Nothing exposes children to a broad, varied vocabulary like reading or listening to exceptional books. Even before children painstakingly learn to blend vowels and consonants, their minds should be stimulated by hearing excellent literature read aloud. In fact, even Miss Mason was amazed that young children were able not just to grasp, but truly enjoy books that were several ‘levels’ beyond their own. Exposed frequently at an early age to living books resulted in children “acquiring a copious vocabulary,” according to her writings. And as I said earlier — I’ve seen this phenomenon first-hand in our home. Excellent book by excellent book, our kids’ brains were basted in hundreds and hundreds of fantastic words over the years we homeschooled. And by the time they took college entrance exams… it paid off! Do I Have to Stop and Look up Every Word I Don’t Know? It seems logical to have children look up the words they don’t know, doesn’t it? Surprisingly, Miss Mason did not agree. She felt as though it was demeaning to children even to offer explanations for words unless they asked. She quite definitively proclaimed that explaining the words destroyed children’s interest in the story and ‘just flat annoyed’ them! So how did she think they would learn words they didn’t know? Charlotte felt that most of the time they had some idea of what a word meant by the context in which it was found. She felt if children read broadly enough, they would encounter words in different contexts and eventually glean quite a competent understanding of them. So How Do We Help Our Kids Add to Their Vocabulary? Generally teach children to try and figure out new words by their context, so they know what to do when they encounter unfamiliar words in their reading. Walk them through the process as you are reading to them if they ask about a word: What is the author talking about here? What do you think it could mean? What other word might fit in that spot (based on the rest of the sentence)? Model enthusiasm for learning new words by circling words during your own reading that you don’t know. Verbally try and figure out what the word means in the context of the story. You might add these words to your ongoing word list, and after you finish reading that section, you might even look up the word just to check its meaning and see if you were right in what you picked up about it from the text. Talk about cool new words you learn. Practice using them in sentences. Pick out vocabulary words from their history and science reading and have them learn the words at another time – not during their reading time. We use this method in our Daily Lesson Plans. Once the light bulb comes on, discuss the need to ‘collect’ more interesting words that will add zing and sizzle to their writing! Then they’ll have better word choices readily available when it’s time to write. Looking at the first example above, ask your student to think of additional words other than virtuous that give more information than the word good. How about admirable, acceptable, superb, valuable, exceptional, and deluxe? Make sure to have him list those more precise words on his chart. Find an example of your student’s writing. View it together, and have him circle any tired words you two find in it. Using a thesaurus, find more specific WOW words to substitute for his tired words. Have him make the substitutions. Have him read his piece with the new words and praise him for the improved writing! Don’t forget to have him add the tired and the wow words he finds on his chart. Have your children add to both lists regularly, and as you teach them to self-edit, have them eventually identify and replace any Tired words on their own without any help from you. After your students do this awhile, they will begin to pay more attention to words from the books they are reading and listening to, and they’ll start remarking about new words they hear and want to add to their lists! As you continue to read, read, read wonderful literature and pay attention to specific vocabulary, you’ll be amazed at the words your children will begin using in their conversation, as well as their writing! Do you think your students are ready to see the difference between Tired and WOW words? If you’ve been reading excellent literature for a while in your homeschool, have you seen your kids’ vocabularies improve?